For the first time in so many years of using EA I had the need to do a global text search and replace – one of my clients wanted to rename something! Now I knew that EA did not provide anything as standard, however a quick look on the sparx community site to find an addin from Helmut Ortmann that does just want I needed – ho_Replace. I was set and my task was done within minutes – thank you Helmut. However, as you can probably guess it didn’t stop there. As reading on the download page there was a comment regarding a problem with installing the tool. Although I had installed without a problem I thought I’d run my Installation Inspector to check the entries only to discover it wasn’t listed. So how does EA know about it? I quickly discovered that EA not only looks for AddIns declared in HKCU\Software\Sparx Systems\EAAddins, but also in HKLM\Software\Wow6434Node\Sparx Systems\Addins, a location my tester wasn’t checking. So to help those looking for these extra AddIns I’ve modified the code, which now checks both HKCU and HLKM locations. Also, as I often find that the line is longer than the screen I’ve added a pop-up form which displays the detail for a single entry, making it much easier to read. For those who have downloaded already may be worth updating to ensure you can see the other stuff. I’ve also been thinking about adding a facility to change the target DLL file – not least as I find that during testing of existing installed AddIns with VS it doesn’t update the DLL location as required. Is this something of interest to others? Are there other functions that would help when developing/testing AddIns? I have updated the entry on the sparx community site – where you can download this new release. This entry was posted in Developer, Manager, Users on 18/11/2015 by exploringea. Back to it – and hasn’t it flown since the summer! I’m still here, but after a summer taking it easy and spending more time than planned doing some rework on eaForms, it was all too soon back to some real world projects, helping others, which have kept me busy, and hence this meant I haven’t had too much time to be exploring EA. It seems that after summer there is renewed energy and an eagerness to get stuff done. I can’t complain it can be really exciting but of course before you know it it’s Christmas; already in the UK we are seeing Christmas goods in the shops and it’s not the end of October year! This also means a new deadline appears – must be done before the holiday season. I am sure it was never like this when I was younger, but I suspect that is the view through rose tinted glasses. However, the eaForms rework was really good fun – not that I always enjoy refactoring code, but after a few years it was good to go back to the design, and with the knowledge gained from use and customer feedback we have been able to streamline some of the internals. It was also the chance to clean out some deadwood. 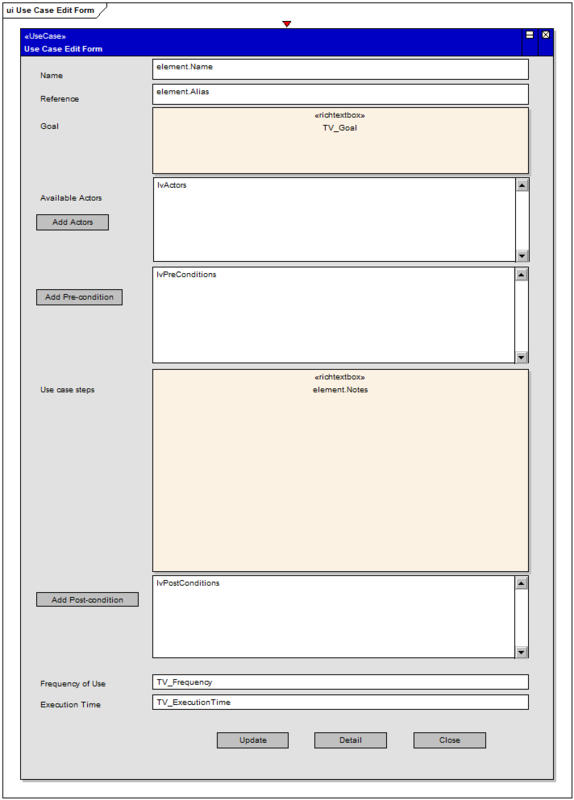 For those who may have seen eaForms a couple of years ago, the initial design used an EA diagram for the form design and keep everything within EA (see example of our initial design), it was fun (especially some of the synchronisation needed), but it didn’t give users the near WYSIWYG experience expected. Removing the need to support this functionality really did help with the rework – it simplified an awful lot and allowed eaForms to become more decoupled from EA in a positive way. This work reminded me of the many projects over the years where I had written code to fulfil requirements for functionality that was really never used. In our case, we thought it was cool to use an EA diagram, but users didn’t! It’s all too easy to add a requirement because it seems like a good idea but really isn’t of value to the customers, however without a crystal ball there is no easy answer. I’ve worked in organisations who do lots of research when defining products, and I’ve seen that doesn’t guarantee success. Datagrid control – which presents collections in a flexible table format with display, editing and adding capabilities. Workflow / “Wizard” like functionality allowing the editing to be split across multiple eaForms sequenced with a defined workflow. For those who may be interested, I’ll put together some short posts on some of these new features in the next few weeks, but if you eager to have a look today you can pop over to eaWorkplace and simply register with them to download a trial version. It also worth noting that all of these were added to meet incoming requirements, for which I’m always thankful, as it also indicates that there is a need for eaForms. And of course far better than me trying to double guess what users really need. If your an eaForms user, and eaForms doesn’t do what you want, let me know – no guarantees we can do it but unless we know we can’t even try! This entry was posted in All on 22/10/2015 by exploringea. We have just released a new version of eaForms which, apart from a few maintenance items, has added 2 functions that I wanted to make my life a little easier, and hence I think could be of use to you. The first relates to the use of the Genfile element field and the element linked files collection. The Genfile field is mainly used in class elements to store the source file which is linked to the class for example through a code import or code generation. When you press F12 the filename in this field is used to select the file that is opened in an editor window. Whereas the linked files is an element collection that can contain details of local files and web addresses. Although we should aim to keep as much stuff as possible in the model this isn’t possible for all items, so having a reference that we can use to access the relevant item is useful. 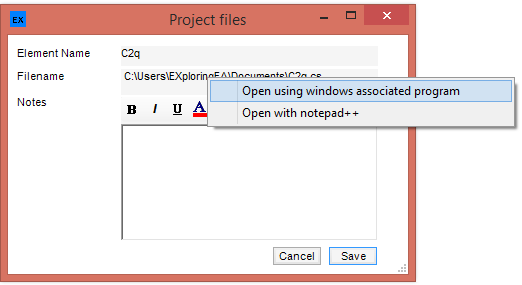 So for these “file references” we have added the ability, within eaForms, to double click on the item whether it be a textbox containing the Genfile field or a listview of linked files, and using either the default windows associated program or an application configured in settings open the file (this can also be used to execute files if required). You can also use the context menu for textbox items as shown in the screenshot below. The great thing is the ability to use a stereotyped element e.g. which contains details of the item plus the relevant filename so that you can directly open the file from within EA. Furthermore, to avoid the risk that the script may not be available to the user we have embedded the script within the eaForm definition, and importantly it is the form designer who is responsible for checking it out! As with any script related operations the uses are possibly myriad, although there are some restrictions. Now, although these features only save seconds they can enhance the user experience or it may ensure important checks are made without the user needing to think. Do you have seemingly simple tasks you perform repeatedly that could be included as an eaForm capability? Let us know what you need. This entry was posted in All on 02/06/2015 by exploringea. Thank you to all those who have taken the time to complete my survey. I have now closed the survey (see my previous post) which was completed by nearly 20 people. To some extent the level of response is no surprise as anybody looking at the forums and blogs will tend to see the same interested people. I had hoped to get a few more to improve the statistical integrity but trust it will paint a useful, if rough picture. In this post when I’ve added my own comments I put them in italics, so hopefully they are clear. Then we looked at use of EA within the organisation. What we see is that it is usually more than a single person using EA and where used, its use is moderate. My interpretation is that in those organisations who have committed to use EA, we see some use beyond the team although this is not the case for all and it is purely just for the team. When we look at our level of EA expertise we see that it is higher than those within their teams and organisation. No surpise as I guess those reading the blogs and seeing this survery are those most interested EA. Now the survey gets in a more specific. The next question related to learning EA and getting information. How do we learn about EA? The responses were interesting in that indicate that stuff is OK, but from the comments there is clearly scope for improvement. One problem I see is that EA is big, really big, and it’s potential use is so great it is a hard nut to crack. To gain valuable use of EA requires either true committment from one or more users in a team, or well designed training and guidance – or probably both. The comments also highlighted a lack of resources. I know if you look around the forums it is the same few individuals (probably you) who contribute (which I trust you enjoy doing!). In fact, EXploringEA probably wouldn’t exist if EA was well documented with tutorials, examples, and other readily available training material covering all topics of potential interest. When we look at the most important features of EA we see that at the top of the list are the front end stuff reflecting the roles of the respondants. Then if we look at allthe features that are used. Now if this was a true reflection of EA usage it would be a concern. The ability to have a single repository of information throughout the project, tracking from the requirements and design to the implementation and testing is highly desirable. Furthermore, having accurate information downstream to support ongoing maintenance is essential. I can only guess that a some stage of the project information is moved to other tools which are then used moving forward to support the product during it’s lifecycle – let’s hope! Automation – – “deploying and operating something in addition to EA is something they usually do not want.” Reflecting the challenge associated with using AddIns. Project management – “I think it can be a good alternative to never-updated projects created in Microsoft Project, but its UI is too technical for the minds of PMs, and therefore may never gain popularity”. No surpise that PM’s don’t want to change. I developed an EA addin for MS Project but found that project managers weren’t really interested in using EA, so a I then produced an addIn for MS Project that accesses EA but still not much interest. If I was in their shoes why would I change, what more am can I gain. One further point is that the project management capabilities within EA look great for managing say a development team but do not cater for the broader business project management, planning and reporting; nor should they! 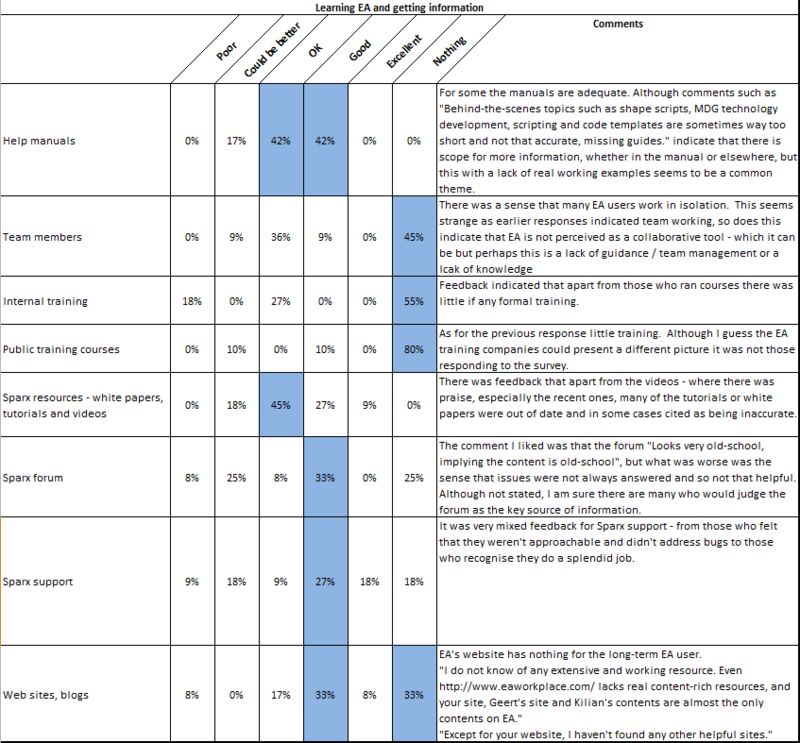 Team management – “I haven’t or hardly found any well-developed use case and user story scenarios models at my clients. Because of this, testing features are of no value for them, until they understand why an up-to-date model with detailed requirements and scenarios are important” Interesting in that I think a lack of real detailed examples really is a limiter. If there were real world examples which were well crafted and could be mapped to current working practices it would be great. I guess that the problem here is that this would be valuable intellectual property and hence nobody is able to provided… Anybody have ideas on what could be done? Maintenance – “Roadmapping works well. Trick is to have as-is and to be changes at the start end end of change dependency diagram.” It was great to see this comment as it really implies somebody is doing the right thing and managing the work from requirements to deployment and ongoing maintenance. What is missing from EA? Better Excel support – I will start with this as I have a personal investment in eaXL and see that this can do a lot – perhaps we haven’t communicated enough detail (! ), so let us know what is needed and you never known. And, now Sparx have their own Excel tools. Intergration with other tools – notably publishing tools to make information available to a wider audience. Although HTML is available organisations how their own preferred tools. Also in trying to do so much “some features need to be sharpened” – which apparently comes from a domain expert indicating that in adding some features they were not accurate in meeting the real need. So there we have it. For me, I’ve had some interesting reading which has generated some ideas for furture exploring and posts. In the meantime, I’d like to thank those who took the time to contribute to the survey, and trust that you find this feedback useful. This entry was posted in All on 26/05/2015 by exploringea. In EXploringEA I’m always keen to look into stuff that may be useful. I have a view that there is so much in EA that I really don’t know about or fully understand (and this could be the same for you). Of course, it is difficult to document such a powerful tool in a way that makes the product fully accessible to all (I have some ideas, but not the mandate or resource!). I know I’ve suffered many times from some small detail being missed, or inferred from a previous topic that I may have skipped, in my eagerness to play and subsequently spend hours trying to get something working! There is plenty to discover, for example from the various forums, however there must be people out there doing some interesting stuff that is never reported and could go well beyond my expectations. Of course, the problem for anybody,especially under time pressures, is getting to know about stuff that may be useful to them when it is needed. Having focused on scripting for a few months (not finished as I’m still exploring a few areas) I’ve been thinking about some other areas that I don’t fully understand, with a view to putting together some experiments to look into more stuff that I hope is potentially useful. I have my candidates list but, following a couple of recent posts I’ve had some useful feedback which has pointed me into some interesting, but not conclusive, directions. In thinking about some of the areas to explore I get a sense that I am missing something. 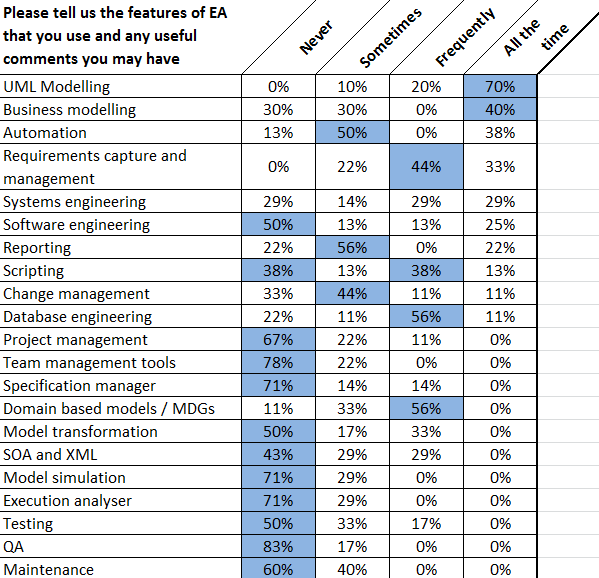 Much of my experience of using EA has been with the front end tasks – requirements capture, modelling, analysis and design; if I look at user guide I’ve not even got half way through! So I am curious to get a fuller understanding of what and how EA is really used. And, with this in mind, there is no better way than to ask you, EA users. So my idea is to conduct a short survey, where you can help let me know how you use EA, what you think it does well, and probably most importantly areas that you would expect it to do better. I’ve tried to make it easy with tick boxes. I am not asking for detail, but have provided space if you wish to add any comments that you think would highlight the value or issues with EA, so that I can just get a better understanding of what is being achieved with EA – what it does as doesn’t do this could be a help to me and others. This anonymous survey is now available at How to use EA survey. I’ll leave it there for about a few weeks, to give an opportunity to as many as possible. Then I’ll consolidate the data and share a summary of the result in a future post, so you can see what our little world is doing with this great tool. I am sorry that I cannot offer any incentives other than I will share a summary of the results in a future post, and the hope that I will continue to post information that may be useful to somebody. And, of course, hopefully be inspired by you to explore other areas and application of EA. This entry was posted in All on 27/04/2015 by exploringea. This post was inspired by a post on the Sparx forum a couple of weeks ago which was asking about automated testing for AddIns. This got me thinking about what can and can’t be done in EA using scripts and/or code, and what else may needed to perform the task. The problem with testing is often that you need to emulate the actions of the user through a windows UI, and this is the case that was highlighted. Without interaction through the EA UI AddIn Broadcasts events are not fired, and hence our AddIn would be outside of the processing loop. If we look at an example. Say we have an AddIn which adds an attribute to every new class that is created. To test this functionality we need to manually add our new class element through the EA UI. So any solution we develop requires us to be able to replicate the manual interaction with the EA UI, perform the required sequence of tests, and then check the results to verify that our AddIn worked correctly. 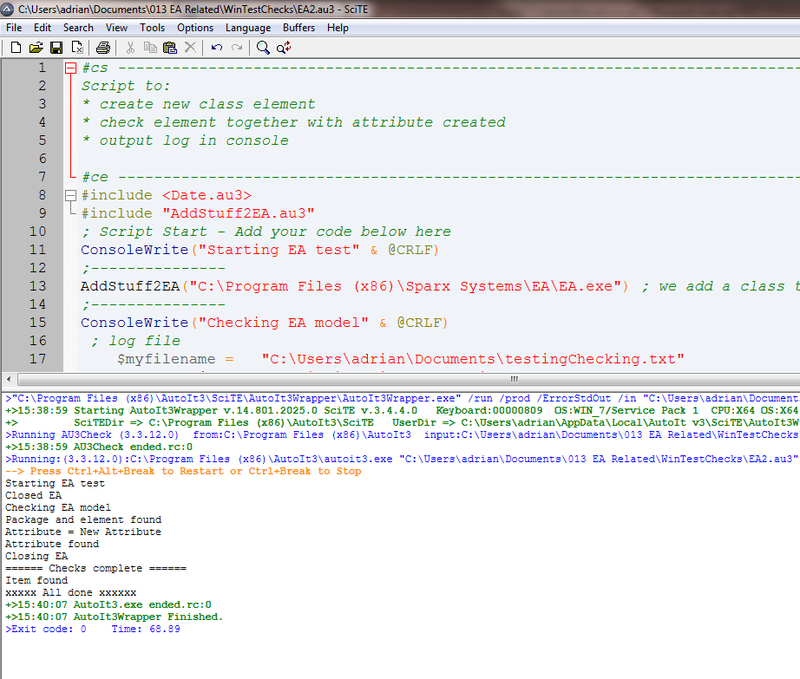 Run a script that could verify our new class element had its attribute added. I was planning on using EA scripts to do this, but as I’ll detail below I ended up using an external script to access the automation API to access the model and perform the checks. So now for the detail and results of my experiment. Nothing special here, so I assume you are happy with this and it’s operation so no further comment. I hadn’t used windows test tools for decades so had to reacquaint myself with what tools were available. A quick trawl around the Internet and there were plenty to chose from, but which? Many required the writing of scripts, whilst others promised more features including the power of recording a users input which could be replayed. So with the aim of minimising my effort, I downloaded a trial copy of one of the more powerful products and set about “recording” my inputs to EA. However, I found it very frustrating with the tools ability to select the correct UI items. When the recorded scripts were replayed I found that they weren’t as good as I had hoped, and failed to select items correctly. Hence the tool failed to perform the required tasks. I suspect the recording process relies on mouse location rather than correctly identifying controls, or the challenge with identifying the EA controls.. So rather than spend more time trying to work around these issues I decided to jump in and write the scripts myself. Based on that decision I downloaded AutoIt (a freeware toolset). The information on this tool stated it could perform the required control selection and provide the required user inputs. A few notes relating to the AutoIt tools. The AutoIt Full Installation download includes all the tools required although it only contains a lite version of SciTE and I read it is recommended that you download the full version of SciTE. You use SciTE that you use to create your scripts with AutoIt Window Info tool to get information that you need from your application under test e.g. control details. You can compile, build, run you scripts from the SciTE tools options, and if you needed can access the Koda GUI Form designer from the same menu. In the SciTE help file, amongst other useful information, is a simple Notepad automation tutorial which was sufficient to get me started – I would suggest you work through the tutorials to gain familiarity with the tools. Also for those interested there are several more tutorials. Following the inevitable trials and errors I was able to write scripts that could select controls and perform the required actions. This code could be improved and clearly if you were in production mode, where you needed to add lots of elements and other stuff, you would restructure with a proper design! Running this script and inspecting the model we can see that the class element has been added together with the attribute added by my AddIn. Now I want to have a means to check the results automatically, checking that the model has the required contents. Accessing the relevant scripts within the EA UI – one of the issues I did find using AutoIt was the ability to access a specific script; I guess that is more I need to explore in the the tool to do this accurately. Wanting any checking to be independent of the creation scripts. 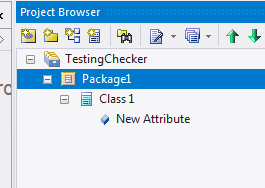 ; now do the check for package "Package1" with "Class 1"
If we now run this script we can see the output in the Console window. We can see the outcome was successful but not that friendly. One useful feature of AutoIt is its capability to create a GUI interface, and thus for the execution of regression tests we could produce an application that was a little more friendly. A useful tutorial “learning to script with AutoIt” includes a brief introduction to using the GUI functions. In addition,and included with the AutoIt download, is a GUI Builder tool (Koda) which can help produce the GUI scripts. Also AutoIt can be used compile the scripts into an executable, which can eliminate complexity that may be associated with running the tests for those without knowledge of AutoIt. So to test this, and using Koda to help design to UI, I created a GUI application with my existing test scripts providing most of the functionality. This simple GUI application is illustrated below. Nothing fancy but straightforward to use. A much more sophisticated application could be developed if required. The plus is that the user simply starts a simple windows executable. 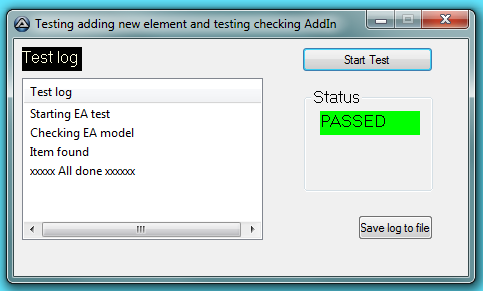 In this post I have explored the ability to automatic test EA AddIn. Using AutoIt scripts to emulate the user input as well as interact with the EA automation API I have demonstrated that this is possible. I found AutoIt straightforward to use and was impressed by its features. Also it is a plus that it is freeware. I hope that this post is of interest to those working with AddIns (as well as other areas) and would welcome your comments or feedback. This entry was posted in API, Automation, Extensions, Scripting, Testing on 14/04/2015 by exploringea. What are the hot EA topics? I’m taking a few weeks off, so I’m in holiday mode enjoying the sun and reducing my time in a dark room of computers, but although I won’t be doing many experiments I had it in mind that one job I should do is to review my list of candidate experiments ready for me return. Every time I look at my list (infrequently), I get a sense that there is so much in EA and however much I explore there will always be more. I guess this is no surprise as the tool evolves to meet users needs faster than I can explore, so my candidate list is just a guide to some of the areas I could explore when I next get idle. Scripting _ If I look back over the last 6 months I’ve spend at lot of time looking at scripting. And judging by what seems to me an increasing number of queries on scripting on the Sparx automation forum I guess this could be considered a hot topic. AddIns – There continues to be a steady stream of issues with AddIns and from the questions raised indicate more people are developing their own AddIns (my advert – we can help with AddIn developments!) as well as more being added to Sparx own list. Documentation and reporting – I have noted an increasing number of questions relating to producing documentation/reports in a variety of formats. How accurate my observations is unclear so I may have missed a major topic; it would be interesting if there were statistics available (Sparx are there?). What do you think I have missed? Perhaps that’s because those using fully understand. What else for my list? In starting to review my candidate list what came to mind was a post on the Sparx forum on testing AddIns last week. It prompted me to think about what we use EA for? From my experience the majority of users fall into the first 3 categories – modelling, analysis and design. I think this observation is further supported by the topics covered at EA user Group meetings I have attended. Yes, there are a few well documented exceptions such as embedded code development but not much else. So are there parts of EA that we are failing to use that could make our developments easier? better? quicker? cleaner? more maintainable? …. It was the post on testing AddIns that reminded me that one of my goals with EXploringEA was to be able to fully understand the viability of managing the whole software lifecycle from product concept to its ongoing maintenance within EA. I had a vision that one tool containing the “knowledge” would help the overall process and its management. Yes, there will be a need to call other tools – compilers, linkers, database tools, documentation tools … but no major distraction and if EA could truly be the kingpin to manage our world, would our developments be better? or am I just trying to push all into a “box” which is just not the right size for the problem in hand? And if there are too many other tools with which we need to interact are we just complicating the process? So is my desire to manage and orchestrate the development in a clear and clean way getting in the way of a realistic development process? I hold my hand up and say I don’t use EA for the majority of my coding but somehow wish I could, and maintenance that’s another story. 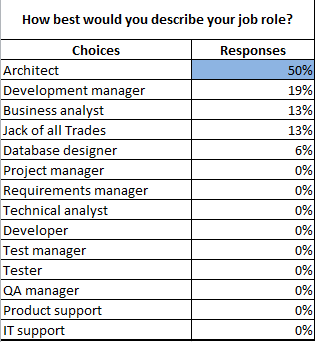 So imagine that EA were the primary tool for our developments, with a few associated specialist programmes to do the detail, how would each of us feel whether we be business analysts, project managers, developers, coders, testers, supporters? 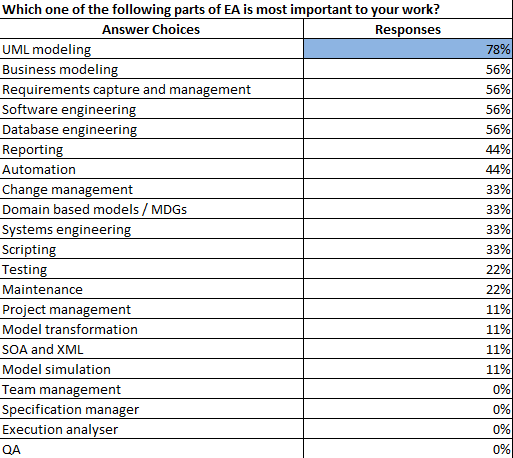 Is EA only suitable for the modelling, analysis, design? Is it sufficient and able to perform these tasks? Can we use it to produce all the documentation that we need, not only for our up front design activities but documents that meet the needs of testers, supporters and maintainers? What additional tools are needed to support general purpose windows development? And always – what questions should I be asking and I haven’t? I also mustn’t forget to ask again – what are the hot EA topics? This entry was posted in All and tagged hot topics on 09/04/2015 by exploringea.